Mayor's Environment Expo: Jack Leslie Youth Environment Grant The Jack Leslie Youth Environment Grant recognizes the positive impact Jack Leslie, former Mayor of Calgary, had on the city and the environment, and is awarded to those youth environmental projects. Amount: $1000. Deadline: April 29,2019. Alberta Ecotrust: Major Projects & Community Grants Community grants support community-based projects that typically focus on local opportunities for change through stewardship and action. Major Grants are designed to support more comprehensive projects that have the potential to result in substantial environmental benefit. Amount: up to $7500 for community projects & $30 000 for major grants. Deadline: Sept (major projects), Oct (community grants) each year. Alberta Environment & Parks: Climate & Environment Student Action Challenge invites Alberta students from kindergarten to grade 12 to develop a school-based initiative or project that will address climate change or minimize other negative human impacts to the environment. Up to $15,000 of total funding will be awarded. Amount: Up to $1000. Deadline: October each year. Aspen Foundation for Labour Education: Aspen Grants offers grants to support projects that promote student engagement in social justice. Projects with environmental and social justice connections can also be funded. Amount: Up to $1500. Deadline: October each year. Government of Canada: Climate Action Fund for Canadian youth between the ages of 15 and 30 for activities that support climate change education. Amount: Variable. Deadline: September each year. Jane Goodall: Roots and Shoots Grants use the funding to support a youth-led action project that makes the community better for animals, people and the environment. Amount: Variable. Deadline: September each year. Learning for a Sustainable Future: EcoLeague Action Project Funding provides funding for students and teachers to engage their school and community in an action project. Funding is available for schools, individual classes, and school groups/clubs. Action projects must be interactive, educational, and address a local sustainability issues. Amount: $400. Deadline: November each year. Mayor's Environment Expo: Eco-Leaders Program provides Eco-Mentors and grants to support student-lead projects to be presented at the Mayor's Environmental Expo in Calgary. Amount: Variable. Deadline: September each year. World Wildlife Fund: Go Wild School Grants support community, classroom, and school initiatives related to wildlife conservation across Canada. Amount: Up to $7000. Deadline: November each year. Devon: STEM School Grants Designed to help educators provide strategic, inventive and hands-on science instruction to spark students' interest in science for junior and senior high schools. Amount: Up to $5000. Deadline: Spring each year. Inside Education: A+ for Energy provides grants for projects focused on energy and GHG emission reduction. Amount: Up to $5000. Deadline: May each year. Alberta Emerald Foundation: Youth Environmental Engagement Grants provide micro-grants to youth-led and youth-targeted environmental projects and initiatives relating to green spaces, environmental learning, renewable energy, habitat conservation, and waste reduction. Amount: $500. Deadline: Monthly from September to June annually. Edmonton Community Foundation: Young Edmonton Grants funds projects by youth in Edmonton. The key to a successful application is an activity that is initiated, led, and organized by young Edmonton and area residents. Individuals (or groups), between the ages of 13 and 24 years, can receive funding to make their idea a reality. Amount: $500-3000. Deadline: Oct. 15, Feb. 15, & May 15 each year depending on when project will occur. The Education Partnership Foundation: Environmental Actions Program will provide grants for schools each year running student-led projects and programs that make a measurable impact on energy use reduction or the natural environment. Amount: $1000. Deadline: No deadline. Schools can apply year-round, and each application funded needs to use the funding within the school year that they received it. Honda Canada Foundation: Grants provide funding for educational institutions, non-profit organizations, and other, tax exempt, national institutions in the fields of family, environment, engineering and education. Amount: 1.5 million+ funds disbursed annually. Deadline: Year-round. The Nature Calgary Education Grant funds projects in Calgary schools to appreciate, observe, study and respect nature in the Calgary area. This grant supports schools in the City of Calgary that require financial aid for a project that teaches students to appreciate, observe, study and respect nature and the outdoors in Calgary and area. Amount: up to $1000 Deadline: Applications are accepted throughout the year and schools can apply for the funding once per school year. TD Friends of the Environment Foundation: Grants support projects in a variety of areas, including schoolyard greening, community gardens, recycling and composting. Amount: Average $2500. Deadline: January and July each year. Alberta Recreation & Parks Association: JOY in Nature Contest Are you part of a group (school, youth group or club) of youth between the ages of 13-19? Do you live in Alberta? Does your group spend time in nature? Enter for your group to be selected for a two-day learning through experience trip to Jasper National Park! Deadline: November each year. Caring for Our Watersheds What can you do to improve your watershed? Research your local watershed and suggest a solution for an environmental concern. Cash prizes are awarded for the top 10 finalists. With your entry, you are also eligible to apply for project implementation funds (anyone that enters can apply for this funding). Deadline: March for Southern Alberta & April for Central Alberta. The Classroom Energy Diet Challenge Offered by Shell Canada and Canadian Geographic, the Classroom Energy Diet is a competition between Canadian classes from Kindergarten to grade 12 to increase awareness and knowledge about energy use among Canadian students (in both official languages). Students complete challenges for the chance to win prizes for their class. Earth Sciences Canada: Where Challenge is a national contest for students aged 9 – 14. Students are asked to discover answers to these questions: What on Earth is in your stuff and Where on Earth does it come from? Learn about careers in geoscience, the mining industry, the environment, and the three Rs. There are $10 000 worth of cash prizes to be won by classrooms. Deadline: Fall each year. The Environmental Artworks Foundation of Alberta: Art Contest Each year provides a new theme and cash prizes are awarded to the top three entries. Deadline: March each year. Parks Canada: Canada's Coolest School Trip Open for any grade 7, 8 and 9 class to win a trip to one of Canada's national parks (locations vary each year). Offered by Parks Canada in collaboration with My Parks Pass partners. Deadline: February, with a voting process in March and a final judging process to select the winners. SEEDS Connections: Green Schools Program allows schools to record the number of environmental projects their students participate in. Schools who complete 100 projects become recognized as a Green School, and may go on to achieve Jade Status (250), Emerald Status (500) and Earth School Status (1000). Staples Canada & Earth Day Canada: Superpower Your School Contest each year schools who take eco-initiatives can share their story enter for the chance to be 1 of 10 schools to receive $20 000 worth of technology to help superpower your school. Amount: $20 000 in green technology. Deadline: January each year. World of 7 Billion: Student Video Contest is open to all middle and high school students worldwide. Students can create a video concentrating on preserving biodiversity, sustainable resource use, or protecting human rights. Participating teachers receive free curriculum resources from Population Education, and the student winners receive cash prizes. Deadline: February each year. 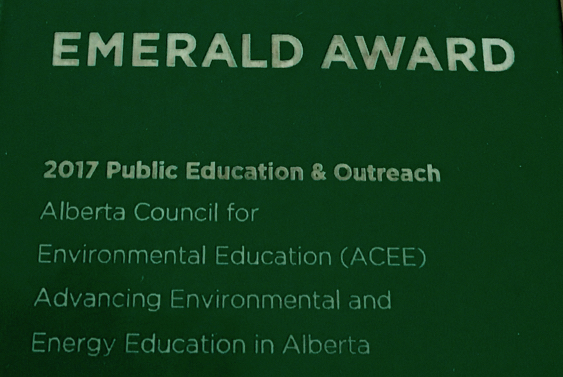 The Alberta Emerald Foundation: Emerald Awards provides awards to youth, classrooms, schools, and school boards for leadership and creativity in addressing environmental matters. The Duke of Edinburgh's International Award is an inclusive self-development program available to ALL young people between the ages of 14-24. The Award is designed to as either an individual programs and/or as a complimentary program that works with schools and existing community organizations to foster community engagement and leadership opportunities. The Award is completed in three levels with four components - service, skill development, physical recreation and adventurous journey. Information and contacts for Alberta, Northwest Territories and Nunavut. The Gloria Barron Prize for Young Heroes The Barron Prize honours young people ages 8 to 18 who have made a significant positive difference to people and our planet. Each year, 25 winners from across North America. Half of each year's winners are chosen for their work to protect the environment. Nomination deadline is in April. John Muir Award is an environmental award that encourages awareness and responsibility for the natural environment, in a spirit of fun, adventure and exploration. The award is the educational initiative of the John Muir Trust. Four challenges are at the heart of the award – discover, explore, conserve and share. Youth of Distinction Award (YODA) recognizes Calgary youth, 13-18 years of age, for the remarkable ways in which they have chosen to live. The awards are not academic rather they focus on leadership, friendship, overcoming personal challenge, and community service. To advance environmental education, it is important to recognize and celebrate the accomplishments of groups and individuals. Please visit the following sites to nominate or view some best practices. Alberta Emerald Foundation encourages all Alberta individuals, organizations and corporations to participate in its awards program. The Calgary Awards are presented each year to celebrate and recognize outstanding achievements and contributions made by Calgarians, and include the Environmental Achievement Awards. Canadian Excellence in Environmental Education Awards are handed out by EECOM (The Canadian Network for Environmental Education and Communication) in almost a dozen different categories. Global Environmental and Outdoor Education Council of the ATA gives awards for environmental excellence every year. Greenest School in Canada The Greenest School in Canada competition was launched in 2014 by the Canadian Coalition for Green Schools with the Canadian Green Building Council. These members of the green building industry contribute their time and expertise to supporting Canadian communities in the transformation of their schools. Did you use our resource hub? Please provide feedback so we can make your experience even better! What region do you teach in? What did you use the Resource Hub for? How likely are you to share the Resource hub with others?